The Mountainside Volunteer Fire Department was first organized in August of 1910. The first department meetings were held at Borough Hall. A bucket brigade was operated until a chemical engine was bought from the town of Westfield, NJ for $35. It was housed at the first firehouse located next to the Borough Hall. The building still stands today and is currently called the Lord Building. In 1918, the Fire Department bought their first fire truck. A 'Flying Thomas,' which was purchased from Rahway in 1921. This engine was equipped with chemical tanks. It was a good engine once it got started. After a few years of hard cranking, the department bought a Reo. This was later replaced by a Mack Pumper in 1940. 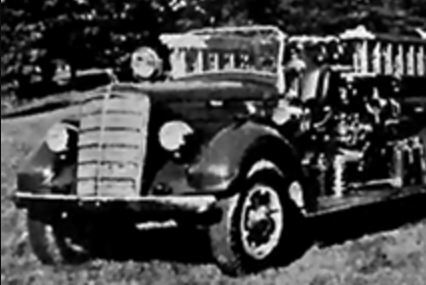 In 1944, the Fire Department purchased a used Ford Chassis and went on to rebuild it into an A-1 Fire Truck. It was put into service 6 months later, after working a total of 865 man hours putting it into service. The second firehouse was a converted wagon shed near Borough Hall, which housed both the Fire Department and The Mountainside Rescue Squad, which the Fire Department founded in 1939. Today the Mountainside Rescue Squad is an independent volunteer organization. The third firehouse was located on Springfield Road (Present-day Rt. 22) at Mountain Avenue, next to the Bliwise General Store. It had two bays for apparatus and a meeting room. Today, the old Firehouse still stands, and is currently home to Atlantic Health's MICU Medic 1 and EMS 8, who assist in providing ALS and BLS medical services to towns south and east of Overlook Hospital, located in Summit, NJ. As Mountainside began to grow in the 1960's, a need for more fire apparatus became apparent. The borough bought an acre site on April 6, 1974, located just north of Route 22 on New Providence Rd. At this site, Mountainside's forth and biggest firehouse to date was to be constructed. The building was completed and possession was taken on April 5th, 1975. This new building, which is the present day firehouse, was dedicated on June 7th, 1975. The present day firehouse is located at 210 New Providence Rd. one block north of U.S. Route 22. It has six large bays for apparatus, offices for the Fire Chief and Fire Company President, and a Radio/Alarm Room. The and floor has a large meeting room and a commercial kitchen. The basement has a newly renovated fitness center/gym as of 2013, and storage space for spare equipment and turnout gear.